mmsonline.com October 2017 MMS 73 FEATURE grinding because of higher material removal rates. 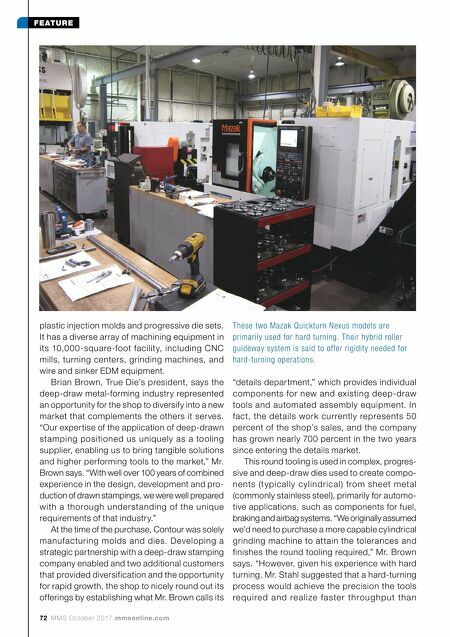 In addition, we could also efficiently turn complex profiles in hardened materials that would be cost prohibitive to grind and possibly require form- grinding operations." 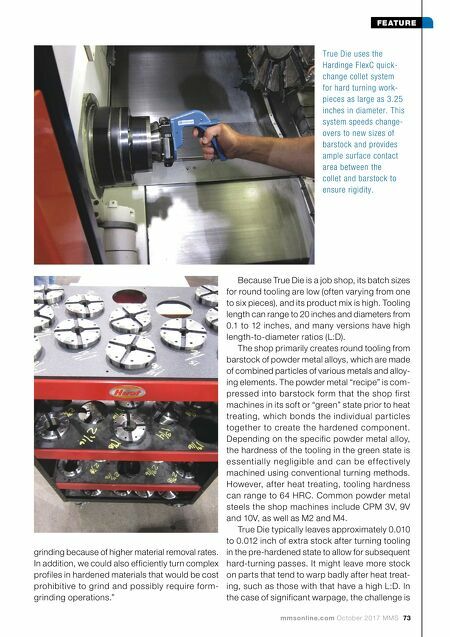 Because True Die is a job shop, its batch sizes for round tooling are low (often varying from one to six pieces), and its product mix is high. Tooling length can range to 20 inches and diameters from 0.1 to 12 inches, and many versions have high length-to-diameter ratios (L:D). The shop primarily creates round tooling from barstock of powder metal alloys, which are made of combined particles of various metals and alloy- ing elements. The powder metal "recipe" is com- pressed into barstock form that the shop first machines in its soft or "green" state prior to heat treating, which bonds the individual par ticles together to create the hardened component. Depending on the specific powder metal alloy, the hardness of the tooling in the green state is e sse ntially ne gligible and can be ef fe ctively machined using conventional turning methods. However, after heat treating, tooling hardness can range to 64 HRC. Common powder metal steels the shop machines include CPM 3V, 9V and 10V, as well as M2 and M4. True Die typically leaves approximately 0.010 to 0.012 inch of extra stock after turning tooling in the pre-hardened state to allow for subsequent hard-turning passes. It might leave more stock on parts that tend to warp badly after heat treat- ing, such as those with that have a high L:D. In the case of significant warpage, the challenge is True Die uses the Hardinge FlexC quick- change collet system for hard turning work- pieces as large as 3.25 inches in diameter. This system speeds change- overs to new sizes of barstock and provides ample surface contact area between the collet and barstock to ensure rigidity.